Some say your previous cat chooses their successor. If so, what in cat heaven's name was Helen Brown's beloved Cleo thinking when she sent a crazy kitten like Jonah? When Cleo died, Helen Brown swore she'd never get another kitten. 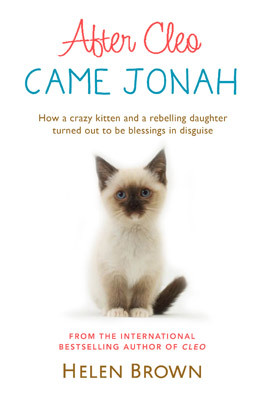 But after she was diagnosed with breast cancer an unscheduled visit to a pet shop resulted in the explosive arrival of a feisty kitten called Jonah. Like Cleo, Jonah possessed great energy and charm. But unlike Cleo, he often morphed into a highly strung and capricious escape artist. Still, as Helen recovered from a mastectomy, he also proved to be a healer in his own right. After Cleo is a warm, wise and often funny account of the highs and lows of mother-daughter relationships, the impact of a potentially life-threatening illness, and an often kooky - some might say deranged - cat called Jonah. Helen Brown was born and brought up in New Zealand where she studied journalism and became a reporter in Wellington. After meeting and marrying a Brit, Helen lived in England briefly before returning to New Zealand and having two sons, Sam and Rob. Helen became a popular columnist and her first book had recently been published when Sam was run over and killed. After the birth of her daughter, Lydia, Helen's marriage broke up and she moved to Auckland where she worked as a feature writer and columnist. Helen met and married Philip Gentry and their family moved en masse to Melbourne not long after. Her first novel, Cleo, was an international bestseller and is currently being made into a film by the producers of Whale Rider.